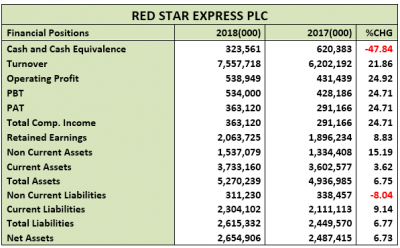 •	This report treats the nine months financial performance of RedStar Express for the period ended 31st December, 2018 and compares same with figures released in the similar period of 2017. 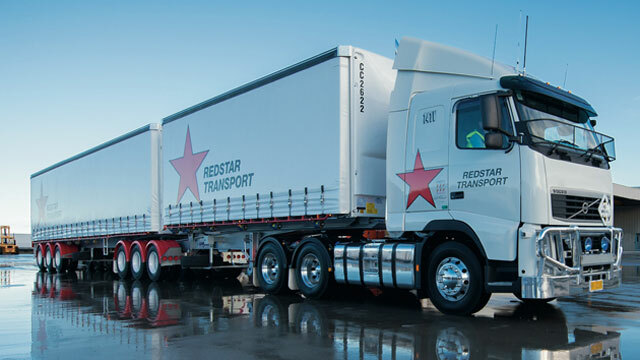 The report also put into consideration, the latest full year performance indices to arrive at fair value for each units of RedStar Express Plc. •	Warehousing and e-commerce Solutions. 2. As a public liability company it enjoys large scale advantage over other participants, taking wide percentage of its market. 3. 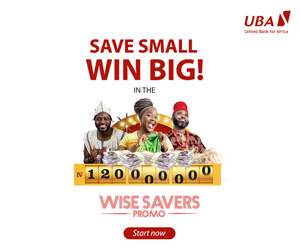 The company is wholly owned by Nigerians with principal shareholders controlling 58.9% stake, chief among which is Stanbic Nominees’ 25.6%; followed by Koguna Hammed Hassan, 18.6% and another 14.7% in the name of Koguna Babura Insurance Brokers Ltd. Other Nigerians own the remaining 41.1%. 4. It also enjoys the support of its international Partner- Federal Express Corporation (FedEx), USA. •	Turnover for the first nine months of 2018 stood at 21.86% above the corresponding quarter in 2017, rising to N7.557billion from N6.202 billion reported in Q3-2017. •	Cost of Sales stood at 75.89% of turnover, slightly below the 74.00% estimated from the similar quarter of 2017. •	Selling and distribution expense was 8.79% above what was reported in 2017, moving from N1.109 Billion to N1.207 billion. •	Similarly, Administrative Expensive posted for the period increased by 8.79% to N1.207 billion from N1.109 billion. •	Operating Profit therefore grew by 24.92% over 2017 figure, improving to N538.94 million from the previous N538.94 million posted in Q3-2017. •	Profit before Tax was estimated at N534.00 million, compared to the N428.18 million reported in the same period in 2017. •	Having considered Tax Expenses for the period, N363.12 million was reported as the Profit for the period, which is 24.71% above corresponding quarter’s profit of N291.16 million. •	Non Current Assets stood at 15.19% above what was reported in the previous quarter of 2017. In the report under analysis, it was estimated at N1.537 billion as against N1.334 billion in 2017. •	Meanwhile, Current Assets improved by 3.62% from the previously reported N3.602 billion to N3.733 billion. •	Non Current Liabilities on the other hand dropped by 8.04% as it is currently estimated at N311.23 million, compared to the N338.45 million in third quarter of 2017. •	Current Liabilities is currently valued at N2.304 billion, 9.14% above the N2.111 billion reported in 2017. •	See the table below for details. •	Debt to Equity Ratio is quite impressive, although within industry range, the estimated 1.60% (Industry average is 1.26%) confirmed the company’s financial strength and shareholder safety. •	Current Ratio stood above unity, implying the strength of the company in settling its current liabilities as at when due. •	The Beta value which measures volatility of the equity on the floor of the exchange stood below market Beta and the industry average. Signifying low volatility/patronage. •	As noted above, the company currently runs at strong financial levels; could smoothly service all its interest yielding liabilities; and even take in more. •	Cost of Sales margin is currently estimated at 75.89%, slightly above the 74.00% estimated in the comparable period of 2017. •	Profit before Tax margin is 7.07% also above the 6.90% margin estimated from the corresponding quarter figures. •	Similarly, Profit after Tax margin stood mildly above that of Q1-2017. We have currently estimated 4.80% as against the previous 4.69%. •	Return achieved on Average Assets is now 6.89% as against the previous 5.90%. •	Testing the management efficiency, the Asset Turnover was gauged; the ratio soared by 14.15% from 125.63% to 143.40%. •	In other words, the equity was multiplied 1.99 times through the first nine months of 2018 financial activities, slightly above the 1.98 times in Q3-2017. •	The yield of the said earnings per share (as at the current market price when the result was made available to the investing public) is estimated at 12.83%, far above the 8.95% yield achieved in comparable period. •	As we speak, the Book Value of Red Star Express is currently N4.50, better than the N4.22 estimated in 2017. When this is placed side by side the current market price (N5.50), one might assume an overpriced position. 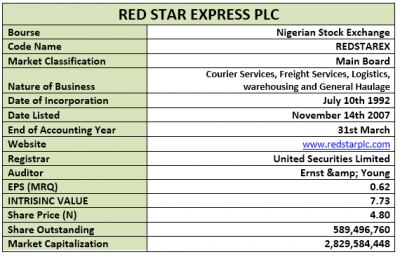 Our weighted average DCF and P/E valuation for Red Star Express Plc gives fair value of N7.73 (which implies a 40.54% upside potential from current price of N5.50. We therefore rate Red Star Express a BUY.